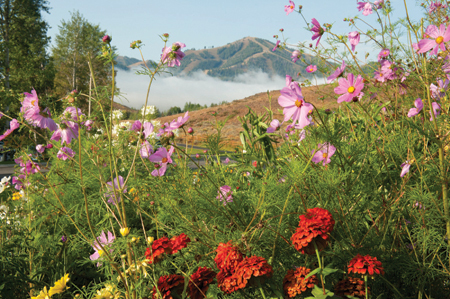 As flowers at Sun Valley Resort take in the last warmth of summer, Bald Mountain rises above a low cloud bank over Ketchum. About one more week of summer remains; fall begins on Sunday, Sept. 22. Fall colors can already be seen in the high country around the Wood River Valley.